Ink Master: Angels will be back. Recently, Paramount Network announced they’ve renewed the TV show for a second season. Paramount Network has ordered 10 episodes of Ink Master: Angels for season two, which is slated to premiere in 2018. New York, NY, November 21, 2017 – The original tattoo-competition “Ink Master: Angels” has been renewed for a second season by Paramount Network. 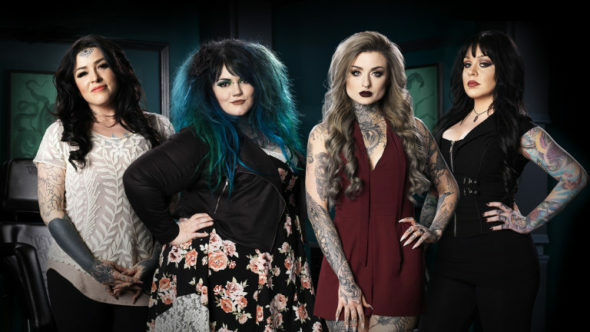 The series from Truly Original features three of the top female competitors from Season 8 of flagship series “Ink Master” – Ryan Ashley, Kelly Doty and Nikki Simpson – who travel the country and go up against some of America’s most talented tattoo artists. Competitors will face a variety of tattoo-based challenges to see who has what it takes to beat the “Angels.” The second season of 10 hour-long episodes will debut on the Paramount Network in March 2018. The Season 2 premiere of “Ink Master: Angels” will accompany the roster of bold original scripted and non-scripted series joining Paramount Network including WACO, American Woman, Heathers, Yellowstone, It Was Him: The Many Murders of Ed Edwards, Rest In Power: The Trayvon Martin Story, etc. “Ink Master” and “Ink Master: Angels” are produced for Paramount Network by Truly Original (“Swamp People,” “The Real Housewives of Atlanta,” “Vanity Fair Confidential”) with Glenda Hersh, Steven Weinstock and Andrea Richter serving as executive producers. Truly Original is a subsidiary of Endemol Shine North America. What do you think? Have you seen Ink Master: Angels? Will you watch season two? More about: Ink Master: Angels, Ink Master: Angels: canceled or renewed?, Paramount Network TV shows: canceled or renewed?